Welcome to Madonna Arts. By viewing the artwork here, you are about to experience a time when artists came close to capturing the beauty and spirit of the Virgin Mary. 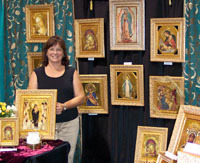 Madonna Arts provides a wide selection of madonnas to choose from. Because they are individually handcrafted, no two are exactly alike. Don’t be surprised if as you peruse the gallery, many images look familiar. However, it’s likely that a particular one will speak only to you. This art is meant to become a lasting part of your home, an heirloom to be passed on from generation to generation. For this reason, the art is created in an rich, old-world style that has prevailed for centuries. On your tour of the gallery, among some of the unique features are “raised” halos and “rosary bead” borders. Only the finest Swarovski crystal and semi-precious stones are inlaid as accents in the crowns and halos. Expect to see Madonna Arts popping up and around town and beyond. I’ve exhibited at national conferences and trade shows, private events, bookstores, hospitals and missions. It may take a little effort but will be worthwhile to place each order by calling my studio: (619) 297-4931, my cell: (619) 991-7475, or e-mailing madonnaarts@cox.net so that I may handle it personally. Enjoy your experience and know that the artist is here to assist you. After all, Madonna Arts began with a calling to bring the Madonna to you.